Sorry for the absence, grad school has been getting on be, but i will be back this weekend with an outfit post. I have to go get ready for my class. One more day till weekend! Yippie!!! wowee to the topshop booties! love how erin wore the animal print.hope things go ok with grad school honey. those boots are Fab...I want them! 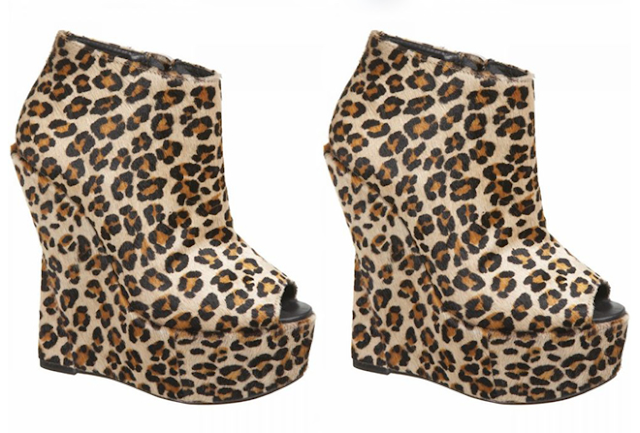 Ahh I dont think I can get sick of leopard print. The Ashish for Topshop wedges are sickkkk. Shame they didnt produce many pairs! i love leopard prints! your music is great! Topshop is so annoying. I believe I am on earth for these boots but I can't find them anywhere hence I feel so useless, incompetent, without purpose.I might be exaggerating just a little bit. I found the black and white ones on ebay, its going for 185 pounds and shipping 60 pounds. It's a bit unreasonable but I am seriously considering getting them and giving up food for the month.